This handcrafted saddle bar stool is a great example of how we can personalize your bar stool. 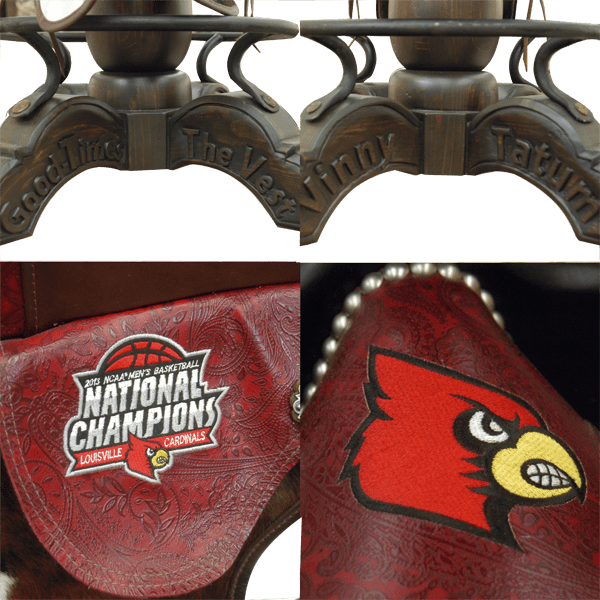 This particular saddle bar stool was designed and made for a client that wanted a bar stool with the logo of the Louisville Cardinals and “National Basketball National Champions” on his personalize saddle bar stool. We can personalize your bar stool in the form you would like, and we can engrave or burn into the genuine leather your initials or ranch brand. 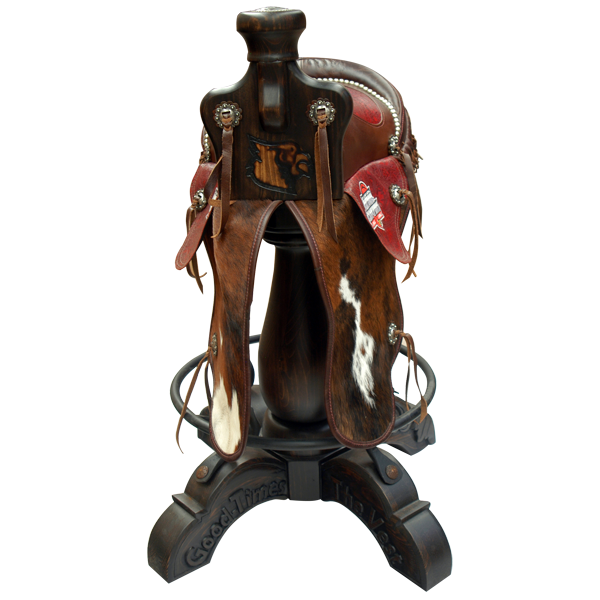 This original handcrafted saddle bar stool features a custom made, red colored, full grain leather backhouse cowboy saddle with horn and swell wood body. 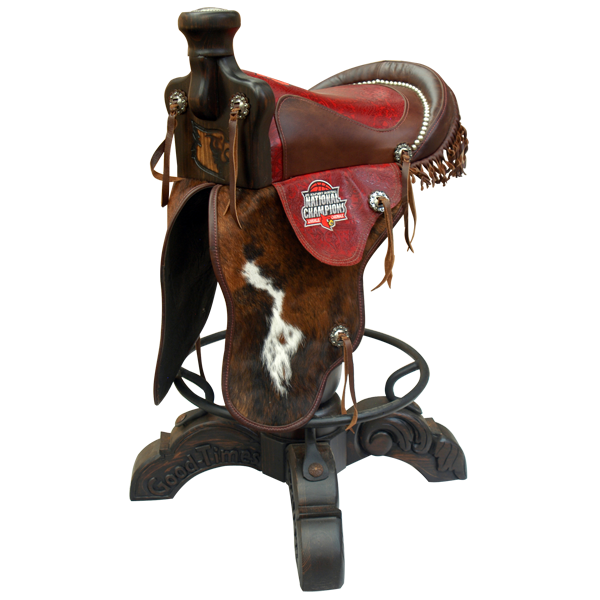 The saddle seat is made of various kinds of full grain leather, including a patterned leather seat and flaps, and real cowhide on long fenders. Genuine leather fringe decorates the low back rim, and the saddle is also decorated with hand forged slotted copper conchos with a silver finish with latigo tie strings. The horn is ornately decorated with a circular inlaid hand forged iron medallion with floral designs. The saddle seat is secured and embellished by hand tacks and double stitched sewing patterns. 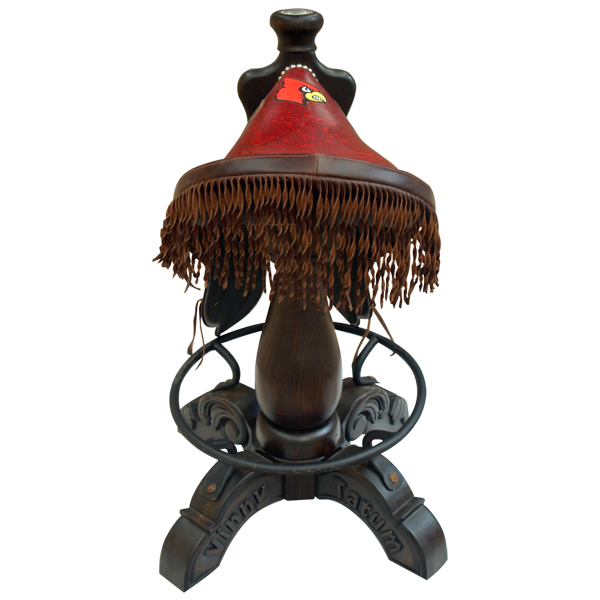 The entire saddle seat securely rest on a hand turned wood trumpet pedestal, supported by four hand carved wood feet, and joined by a hand forged circular footrest. It swivels 180° and is 100% customizable.